An ecological and affordable modular system with focus on self-building was developed to support skills, autonomy and maintenance. The wide spread knowledge of working with concrete and steel and the easy accessibility of cement and basic steel profiles provide the opportunity to involve local labor. 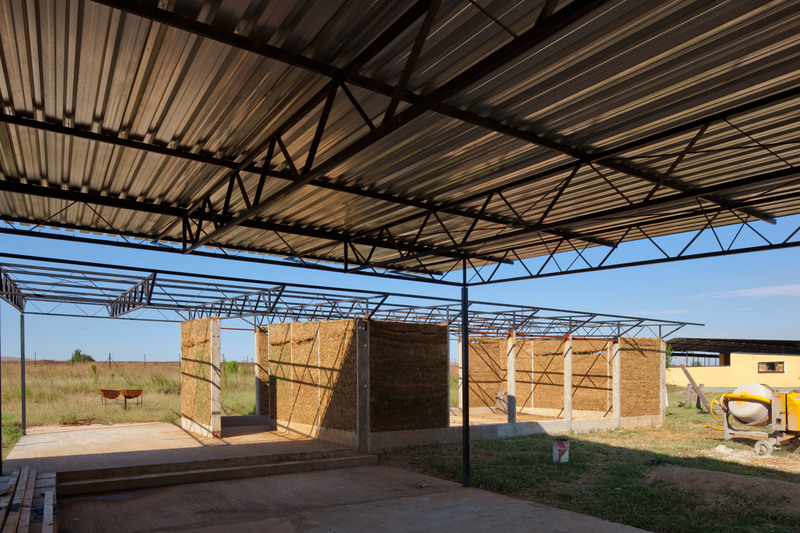 The loadbearing concrete pillars and steel trusses are produced on site by members of the community and older learners and bought from them – providing an income generation. 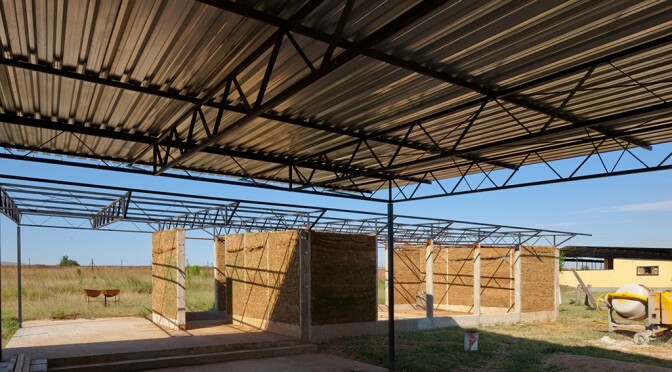 The ecological straw-light-clay wall infill was developed from traditional construction methods in South Africa and Europe and transferred in a present context and its demands. It provides insulation and accumulation within the element for comfortable room climate in winter and summer. Advantage lies on the availability of the prospective users – (financially and geographically) easy to transfer know how, appropriate technology (as no special tools are needed) and is workable for adaption concerning users needs. The design parameters are orientation with the sun – capturing in winter and shading in summer, natural ventilation, and the modular grid. 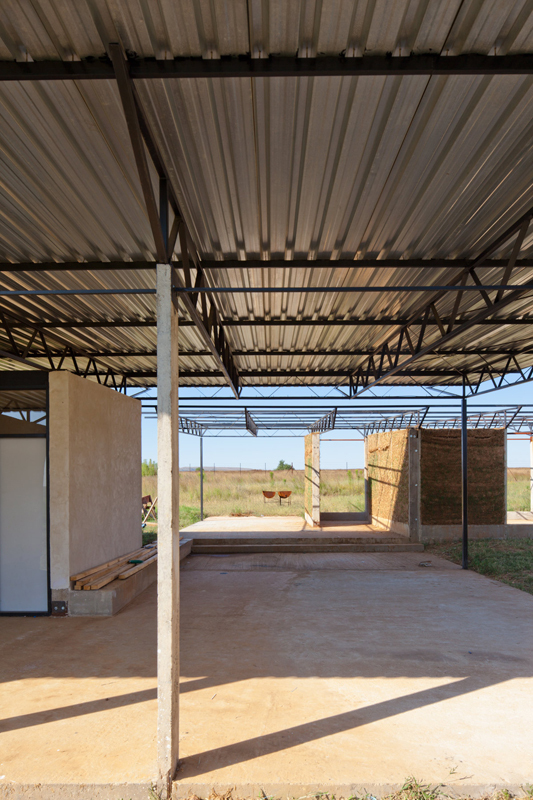 The placing of the three classroom units, each with generous covered pathways overlapping each other as a respond to the terrain and to create seating areas, form semi-public courtyards. Openings are placed to enable cross-ventilation, natural light and surveillance of the kids. The whole construction process from setting out to interior finish was a collaborative approach between build Collective and local construction team. A furniture design was developed with teachers and construction team to equip the whole school and to enable a continues production and income generation beyond the main construction phase. 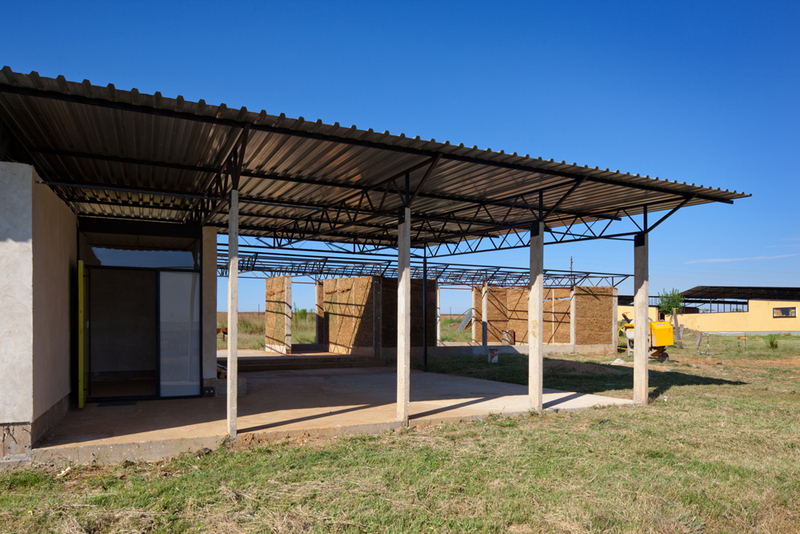 Years of active collaboration with the school and the local construction team on several projects for the Ithuba Community College, foremost the Carinthia University of Applied Science created collective knowledge and experience of resources serving the design process. The design therefor drives from past project as a learning curve as well as functionality for the school and workability for self-building. Furthermore it serves the need of housing in the area through its modular construction method, affordability and skills transfer. 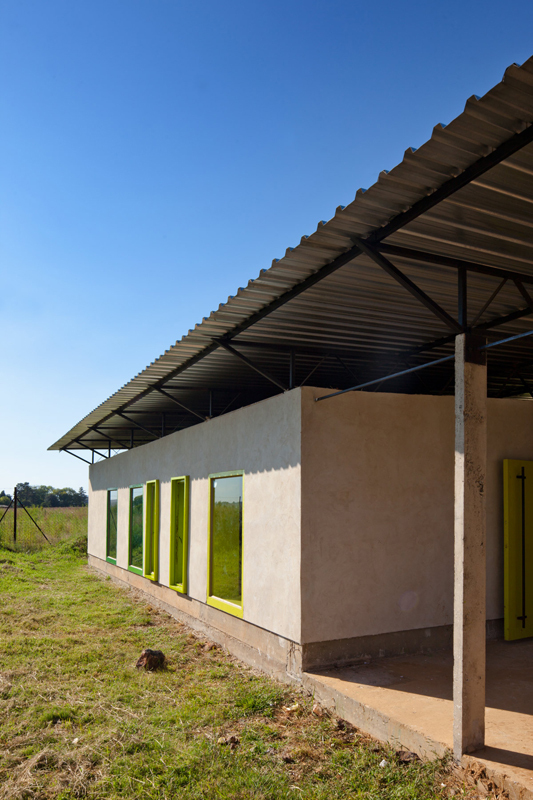 Community members and a group of learners were guided thru out the construction process from prefabrication, setting out, foundation, load baring structure, light-clay infill, roofing, plaster and interior. The collaborative approach enables the broader understanding of design and construction process and enforces skills development up to problem solving ability. This guarantees a sustainable knowledge transfer and maintenance of the building. Further it supports local economy and direct money flow through contract basis, daily wages or the purchase of building parts. The local motto “each one – teach one” and a respectful exposure between culture, gender and age group enable the collective creation of space. The projects success is measured by the satisfaction and comfort of users – teachers, school management, kids and successful maintenance through members of the construction team. As it is three classroom of the same design, the gained knowledge and skills can be measured in the process. Through a slow backing down of guidance by build collective a more and more autonomous and self-organized construction process is enabled. Further the continuous production of furniture and building parts. In addition the construction team could apply their skills in their settlement by building the first straw-light clay building for a local business in their neighborhood. Previous Postcolors of my season installationNext Postpeople building better cities !